Floral naths for your Mehendi is the new trend in town! Floral jewellery is most brides’ favourite pick when it comes to accessorizing for their Mehndi function. While floral ‘naths’ have been quite a popular pick overseas, in India you may have not seen a lot of brides go for it. This gorgeous floral nath made with the petals of pink roses and white jasmine is just stealing my heart away! The nath chain created with pearl beads is perfectly completing the alluring floral nath! We spotted real brides sporting this artificial white mogra floral nath with a white beaded chain. Simply a Wow affair! P.S.- Loved the hanging bead at the bottom of the nath. This bride’s choice of an absolutely adorable minimalistic gold chain nath with pastel pink rose petals completes her bridal look perfectly! This bride went for a gorgeous floral nath with Mogra flowers decorating the bottom of it. The golden nath is completed with a white beaded chain. This gorgeous white floral nath chain simply too pretty to look at! The simple gold nath gets its added elegance with this additional mogra flower chain! For a bride that is a lover of florals, here is the perfect option for you. Another stunning example of a beautiful bridal nath. This one here features an artificial yellow rose flower as the nose pin decorated with white beads. The nath has a pretty white bead chain completing its look! If you are a nath fan, but still want to keep it minimalistic then I think this is the perfect choice to go for. It features a simple pastel pink flower at the nose pin with a gold chain completing the nath. The three different kinds of floral naths shown here give you an option to choose the best one according to your personality! The extreme right one features a floral nose pin with a beaded chain. The middle one features a nath half decorated with white and pastel pink flowers completed with a pearl chain, while the extreme left one features a floral extravaganza nath with white flowers starting from the nath and covering the entire chain. So, what’s your pick? This might not be a proper floral nath, but if you believe in a minimalistic look, well, look no more. This simple nath is perfect to complete your minimal bridal mehndi look! P.S.- Loved the floral bajuband! 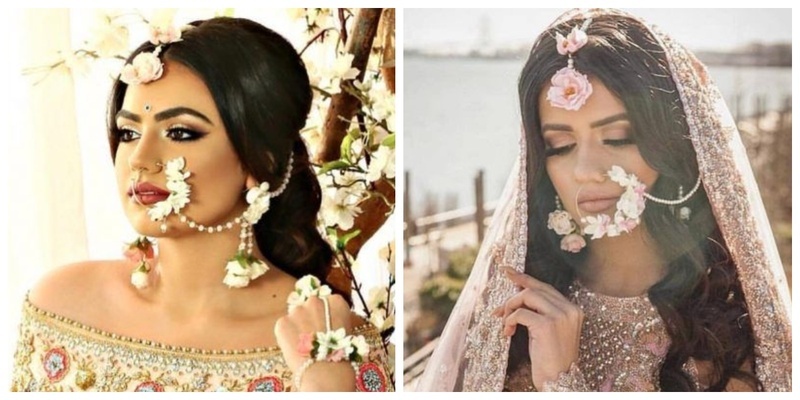 So brides, which one did you pick to complete your Mehndi look?